I don't talk about it very often, but I'm lactose intolerant. For years I fooled my body into thinking otherwise by popping a dairy pill just before devouring a pizza, a soft serve cone or a big bowl of yogurt. On the cusp of turning 30 though, my body has decided that its done with the pills and now chooses to just reject dairy all together. Sure I'm a bit bummed, but I'm taking this on as a new culinary challenge. Pizza toppings need to be more exciting to make up for the lack of cheese, breakfast can't just be yogurt and granola, and ice creams need to be coconut based. 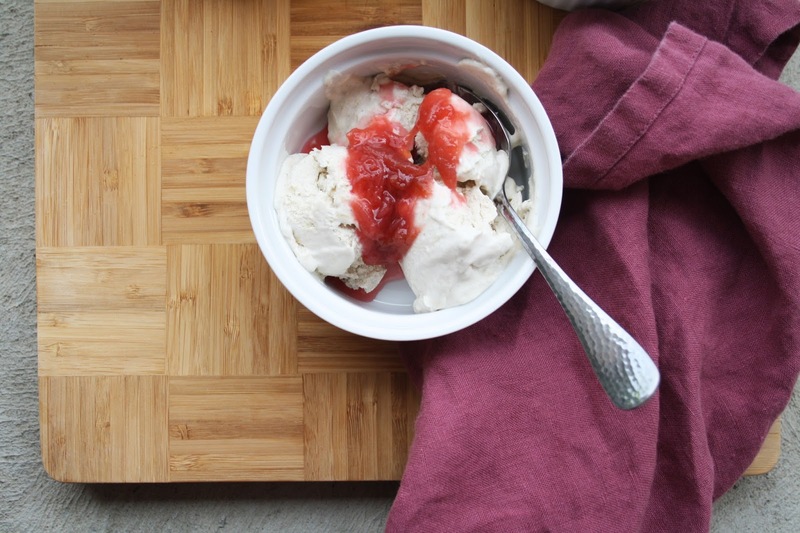 So here I am, almost exactly one year later, trying to replicate last years rhubarb ice cream goodness, but without the dairy. If you've been around here long enough, you'll know that my love for rhubarb runs deep. 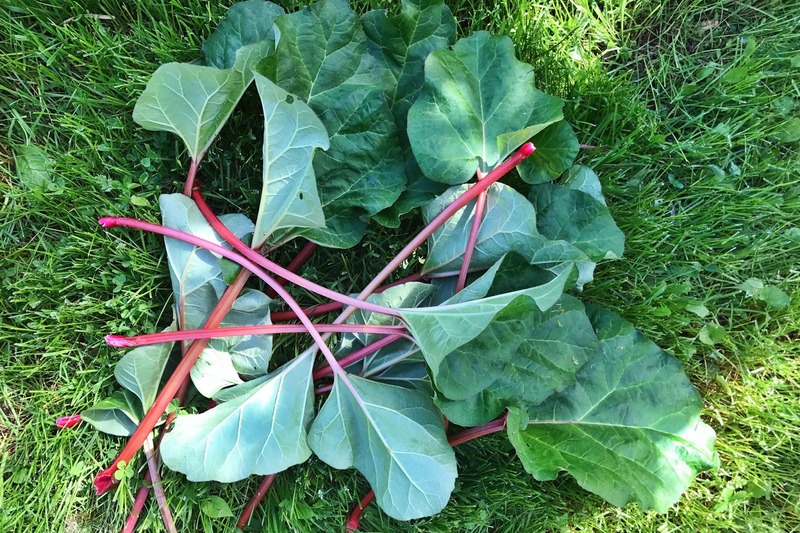 We inherited a garden that's bursting with perennial rhubarb (winning!) and I couldn't be more excited. This week alone there's already been crisp, compote, this ice cream, and dreams of this cake. Its going to be a good couple of weeks. Happy end of Spring friends! This recipe is SUPER easy, but takes a bit of forethought. The night before, soak the cashews and make the compote. 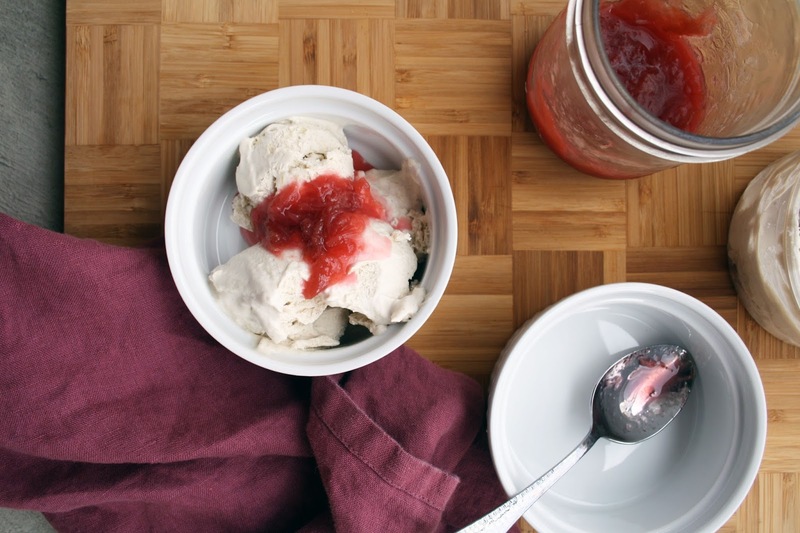 You want the compote to be cold when you fold it into the ice cream, otherwise you'll end up with a melty disaster. The night before, soak the cashews and make the rhubarb compote. Combine the water, sugar and vanilla in a saucepan over medium-heat. Allow the sugar to dissolve completely, then add the rhubarb. Bring to a boil, reduce to a roaring simmer, and cook, uncovered for 10 minutes - stirring occasionally to break up the larger pieces. After 10 minutes, remove from the heat and store in an airtight jar in the fridge overnight. Day of, drain the cashews. 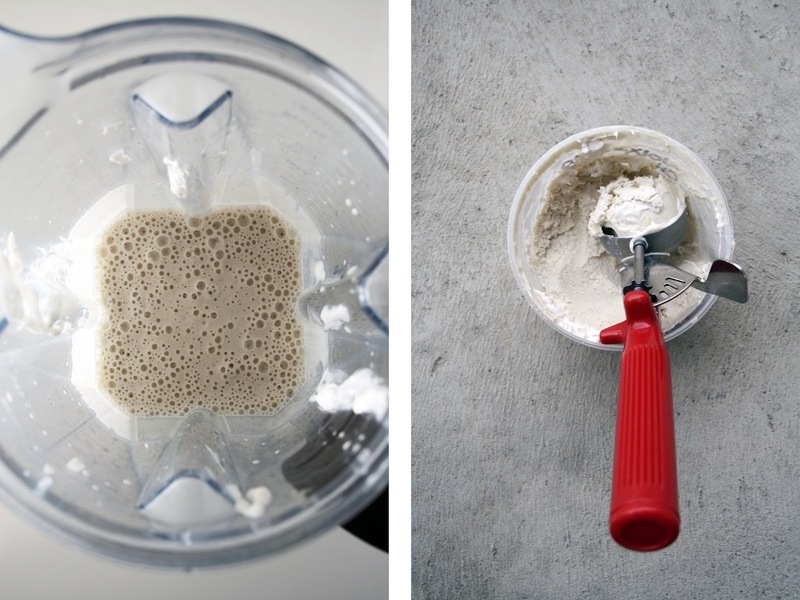 Combine them in a high speed blender with the coconut cream, maple syrup and vanilla powder. Blend until creamy, about 1 minute. If the mixture gets hot, transfer it to the freezer for a few minutes to cool down. Pour the mixture into the chilled ice cream maker and follow manufacturer's instructions. Half way through (this was the 10-15 min mark for me), add 2/3 cup of rhubarb compote, saving the rest for later. Serve immediately, with a heaping scoop of the reserved compote. If not eating immediately, be sure to take it out of the freezer 10-15 minutes before serving (the joys of dairy free ice cream).